Diane Jones Textiles creates unique, hand-painted devore velvet scarves in a wide variety of beautiful patterns derived from the natural world. Her stylish scarves are available in a dazzling array of colours ranging from subdued pastel shades through to gem-like colours that shimmer in the light. Her designs range from songbirds and butterflies, flowers and foliage to Aboriginal designs and subtle stripes and spots. These wonderful scarves can enhance many outfits, and are versatile enough to wear in any season, making them fabulous gifts. 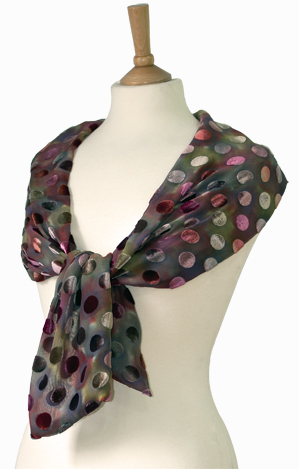 The range of Diane Jones Textiles products also extends to Crepe de chine scarves featuring bold, contemporary designs and embroidered pictures and unique gift cards again drawing inspiration from the natural world. If you would like to purchase any of her products you can find Diane Jones Textiles stand at many art markets, events and fairs throughout the year, especially during the Christmas season, or use the Contact form to communicate directly. Diane Jones versatile devoré and crêpe de chine scarves make wonderful gifts and are available at a variety of high-quality retail outlets throughout the country. A range of embroidered pictures and cards are also available. You can find the Diane Jones Textiles stand at many art markets, events and fairs throughout the year where you can purchase our full range of products including her wonderful devoré and crêpe de chine scarves.